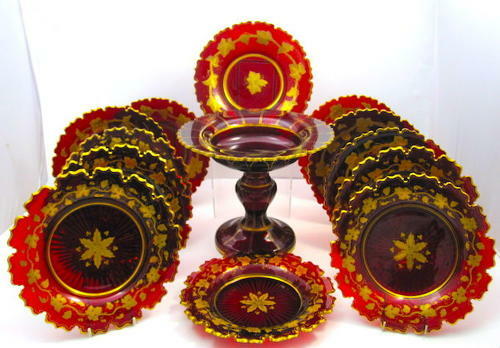 High Quality Antique Bohemian Ruby Red and Gold Crystal Dining Set Comprising of 12 Plates and a Centerpiece. Each Plate is Finely Engraved in Gold Decorated in 2 Patterns. High Quality Bohemian Ruby Red Crystal with Fine Gold Enamelling Decoration. A Wonderful Example of The Highest Quality Bohemian Glass.